I love all of the colors! To bring more color in my life, I’ve been trying desperately to purchase more colorful clothing to add to my all black wardrobe. Goth at heart because of my old hair styling days! Yay! Thank you! I missed this series. This is A LOT of color for you!!! 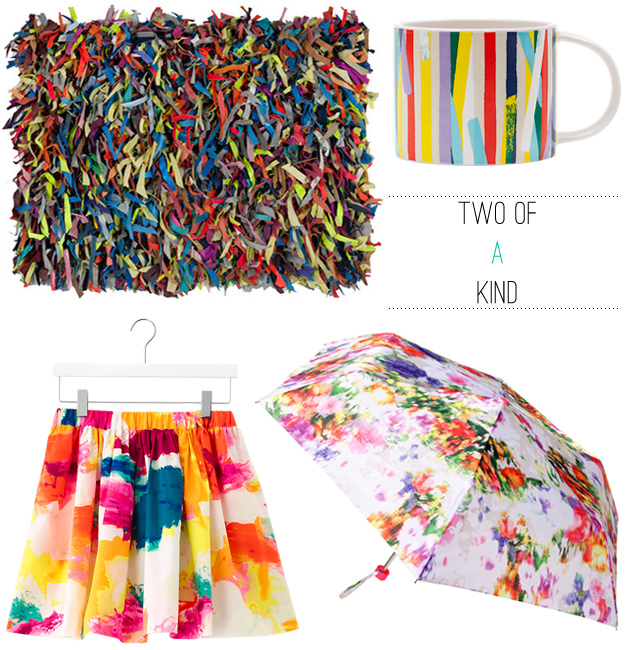 I adore the water color prints, and how cute is that umbrella?!? i have to admit i have never been a fan of kate spade. so much talent in the world and she got to be this giant famous designer i just never understood it. i love the umbrella but did you know we don’t use umbrellas in portland? it’s like an unspoken rule around here. natives mock those who use umbrellas – so i have never owned one :( but if i could own one, i think i might own that one. or i have always wanted one of the clear plastic ones that you can stand half your body in. Very Summery! I love the umbrella. Ooooh perfect summer goodies. That brolly would be the perfect accessory for me and would stand out from the sea of black brollies that everyone has in London. I’m really intrigued by Christine’s comment – why don’t they use brollies in Portland? Does everyone wear rain ponchos? I’m going to have to google that one. Yay two of a kind is back! Love all the items, although at first I thought the rug was a pillow and got all excited. The umbrella is so cute and would bring some color into the sea of black umbrellas you always see floating through New York on a rainy day. Umbrellas in a crowded city always make for dangerous encounters, I cannot count how many times people have almost poked out my eyes or hit me in the face with their umbrellas. Maybe this is why they don’t like to use umbrellas in Portland?